FILE - Lee Juan Tyler of Idaho waits for President Barack Obama to speak at the 2015 White House Tribal Nations Conference, Nov. 5, 2015. Despite the problems facing Native Americans, they rarely are a priority in U.S. presidential elections. Throughout the U.S. presidential primary campaign, candidates have made a point to focus on the concerns of politically influential minority groups, including African-Americans, Latinos, and Asian-Americans. But one group that has largely been overlooked is Native Americans. It's nothing new: Native Americans are hardly ever a priority in U.S. presidential elections for a variety of reasons. First, they make up a relatively small portion of the overall population. Second, they tend to vote at much lower rates than other minorities. And third, they're bunched in states not seen as crucial to the primary election process. But the problems facing America's indigenous people are daunting and, in many cases, are much more severe than the challenges faced by other minority groups. "Nearly everything that is bad in America — whether drug abuse or high school dropout rates or violence — is much worse on reservations than it is in the outside community," said former U.S. Senator Ben Nighthorse Campbell, a member of the Northern Cheyenne tribe. A quick glance at stats compiled by the National Congress of American Indians (NCAI) shows the extent of the challenges. The U.S. unemployment rate currently stands at 5.5 percent. For Native Americans, the unemployment rate is a staggering 22 percent, more than twice that of Hispanics and African-Americans. Overall, one in four Native Americans lives in poverty, about double the rate of the general population. Police violence also disproportionately affects Native Americans. According to a study by the Center on Juvenile and Criminal Justice, Native Americans are the racial group most likely to be killed by law enforcement. Yet, presidential candidates have barely mentioned Native Americans. Only two candidates, ex-Secretary of State Hillary Clinton and Vermont Senator Bernie Sanders, make any mention of Native American issues on their campaign websites, according to a VOA search. None of the Republican presidential campaigns responded to VOA requests for comment on whether they were reaching out to Indian Americans. "Without getting into party politics, all I can say is that I've heard public speeches from the two Democratic candidates, but not so much from the Republican contenders," said Robert Holden, deputy director of NCAI. But Congressman Markwayne Mullin, a Republican from Oklahoma and one of only two U.S. congressmen of Native American descent, told VOA that several Republican presidential candidates have contacted him about Native American issues. 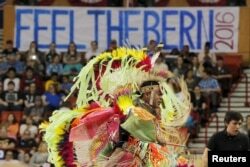 FILE - A group of Native American pow-wow dancers perform before a campaign rally with U.S. Democratic presidential candidate Bernie Sanders in Oklahoma City, Oklahoma, Feb. 28, 2016. "Out of the current field, all but one has reached out to me," he said. "The only one that hasn't reached out to me is the one that's at the top of the ticket right now." So why aren't more presidential candidates bringing Native American issues to light? Part of it is the nature of the U.S. primary election calendar. None of the early primary states have the highest percentage of Native American populations, explains Holly Cook Macarro, who worked on tribal intergovernmental affairs in the administration of former President Bill Clinton. "We've seen the African-American communities and their issues get a lot of attention as the primaries have moved through the South, and we've seen the Latino communities and their issues get a lot of attention in states such as Nevada," she told VOA. "But usually, by the time we get to those states with high Native American populations — like the states in the Southwest, for example — largely the presidential nominations are settled," said Macarro, a member of the Red Lake Band of Chippewa Indians. In Florida, which holds a crucial primary vote Tuesday, the problem is mathematical. Native Americans make up only about a half of one percent of Florida's population, allowing their concerns to be marginalized. Betty Osceola, a member of the Miccosukee tribe, says some of the most urgent issues facing her community are environmental. Osceola runs an airboat tour company in the Everglades, a region where persistent economic development threatens indigenous lands and sacred burial grounds. Other problems include intentional flooding, which threatens three islands that provide high ground that many Everglades animals such as alligators need to survive. Another issue is water supplies that are poisoned with harmful toxins, such as phosphorus and mercury. The environmental issues have now made it impossible to live off the land, Osceola says, citing experts who warn against eating more than one fish per week caught in the Everglades. Similar problems affect Native American communities around the country, but result in little outcry, says Tara Houska, a tribal rights attorney and a citizen of the Couchiching First Nation. She compares the situation to that of Flint, Michigan, where lead poisoning of a water supply in a predominantly African-American community led to a nationwide uproar and repeated visits by presidential candidates. "That's a situation that's been going on in Indian country for decades," Houska said. "Thirty percent of the Navajo nation is without clean drinking water. It's been that way since the 1950s. But no one really cares." Houska, who is advising the Sanders campaign on Native American issues, says she is encouraged by the emphasis the Vermont senator has put on indigenous affairs. “From a campaign perspective, going out and doing outreach to the people that are approximately 2 percent of the population, I don’t know if that’s going to necessarily help win an election,” she said. “But at the same time, [Sanders] recognizes these are extremely oppressed people, and that fits with everything he's done his whole life with social justice and human rights and understanding that everyone needs to be included,” she added. Houska and others also stress that the Native American vote can be more impactful in state and local elections, as well as in the general election in November. In a way, though, winning elections is not really the point, said Macarro, the former Clinton White House official, who views Native American issues as a bellwether that reveals the character of presidential candidates.